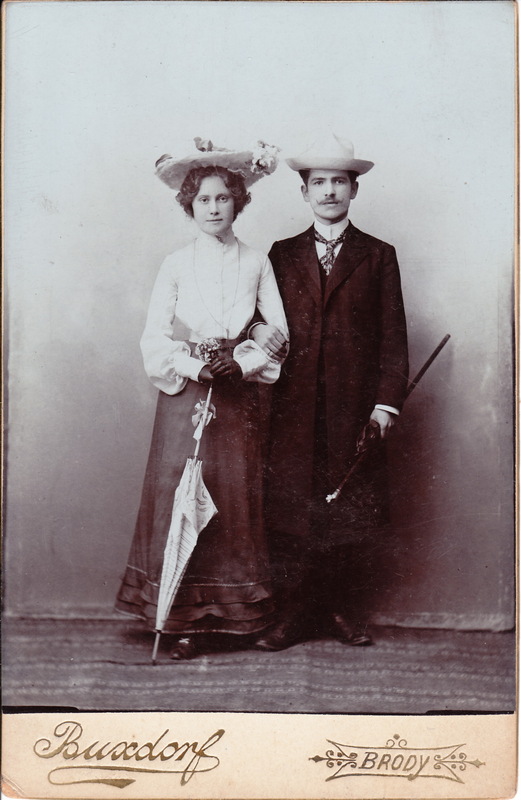 This Cabinet card featuring a well dressed couple, offers a bit of mystery. The last owner of this card states that this couple are “Brody Yiddish Singers”. So what does that mean? First of all, Brody is a city in Lviv Oblast (province) of western Ukraine. The city was a crossroads and jewish trade center in the 19th century. Brody is considered to be Shtetls, Brodersanger, Purim, Jewish theater, CzarAlexander III, Berl Margulis, Berl Broder, one of the “shtetls”. The city was famous for the Brodersanger or Broder singers who were among the first Jews to publicly perform Yiddish songs outside of Purim (a holiday) and wedding celebrations. These performers were the precursors of jewish theater. Due to anti Jewish regulation enacted in 1882 by Czar Alexander III of Russia and the resulting exodus of Russian Jews; throughout 1881 hundreds of Jewish immigrants arrived in Brody daily. The most famous Broder singer was Berl Margulis also known as Berl Broder (1815 -1868). It is not certain that this cabinet card really depicts Broder singers and no evidence is available to support the claim , but it is not unusual for families to pass down such information over generations and there is a reasonable chance that the history is correct and the story is worth telling. The photographer of this cabinet card is Buscdorf.